This time the chart indicates the average read response time IOmeter recorded for the [1460 B; 100% Read; 0% random] I/Os. As the chart indicates, when the network is saturated the average read response time is higher than 0.5 mS for the Azure Low bandwidth. As observed in the previous tests, the only way to reduce the average response time for Azure Low is by reducing the network packet data size. The consequence will be – a lower data transfer capacity, but with good latency response times. After seeing all the benchmark results we can clearly say this type of network is adequate for DNS, DHCP, LDAP and in general all the protocols who are not data intensive network operations. The above stacked column chart represents the latency distribution for the [1460 B; 100% Read; 0% random] IOmeter benchmark. 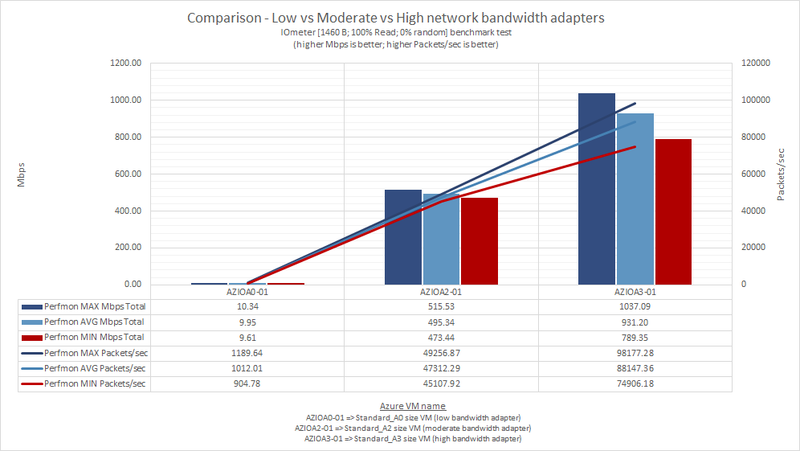 The best performer is Azure High network bandwidth (AZIOA3-01), followed by Azure Moderate (AZIOA2-01) and Azure Low (AZIOA0-01) network bandwidth. Please note the time axis is not linear (it is a logarithmic one), case in which the jump from one interval to the other is considerable high. If we pay attention to the Azure Low network bandwidth we can see a very high percentage (91.875954%) of its I/Os being completed within 0 and 50 uS (microseconds), but it also records some percentages outside the 0.5 mS limit. Even if those percentages are small, the fact are recorded for intervals like 15 to 20 mS or 30 to 50 mS are making the Azure Low network bandwidth not a good performer (in comparison with Azure Moderate and High). Looking at the average speeds registered by Azure Very High and Azure Extremely High network bandwidths, I tend to say again – there is not that much difference between them in terms of performance. In terms of read response time, all these VMs registered in average under 0.5 mS. That means the Azure High, Very High or Extremely High network bandwidths can handle very well the network traffic even when the network is saturated with this type of traffic ([1460 B; 100% Read; 0% random]). 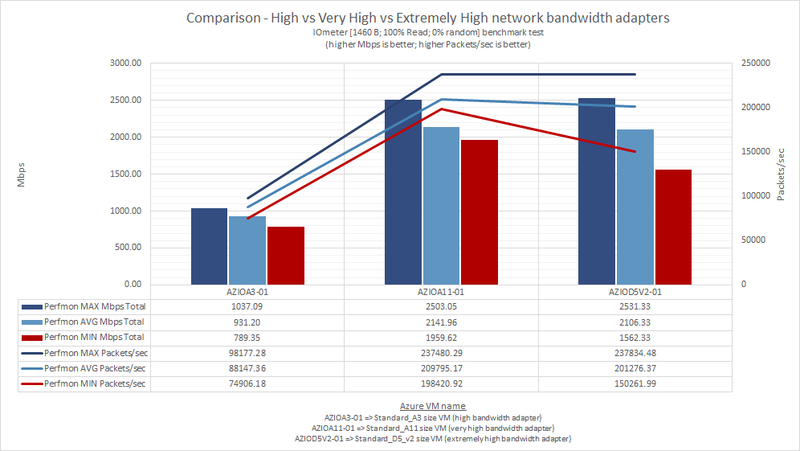 If we look on the latency distribution chart, for this type of benchmark it is very hard to decide who is the first and who is the second in terms of performance (the third is clearly AZIOA3-01 – Azure High network bandwidth). I tend to say, the “battle” between them is given by the decimals and becomes a mathematical one. I think in reality the performance differences are too small to be observed. So no matter if we discuss Azure High, Very High or Extremely High network bandwidth – for this benchmark, all of them indicated good results from latency point of view.